This conference was the eleventh in a series formally known as the Space Manufacturing Conference. This year’s conference was dedicated to the memory of Dr. Gerard K. O’Neill, founder of Space Studies Institute, author of “The High Frontier,” and organizer of the first conference held in 1974. This year’s conference offered the most optimistic view concerning our ability as a species to break out into space. Following is a listing of sessions, chairpeople and a brief summary of each session. Dr. Lennard Fisk, Chief NASA Scientist, delivered the Keynote Address on behalf of NASA Administrator Goldin who was unable lo attend. Fisk noted that we are al the crossroads in the US space program. It is a time for reexamination and reevaluation. These processes will determine the role space exploration will play in our society in the future. Dr. Fisk was optimistic in his presentation when he discussed the future of space and the inevitability of human expansion into space. He outlined eight reasons the US should make an investment in space. 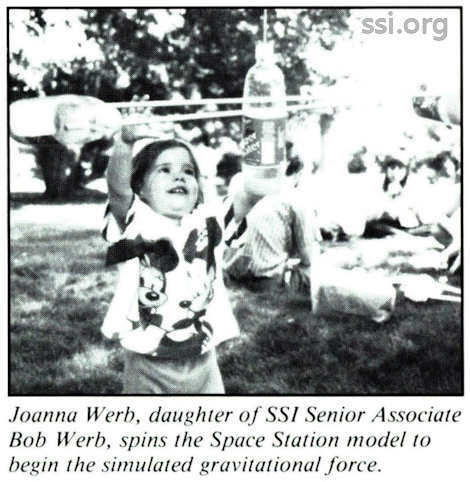 They were: 1) technologically challenging tasks, such as space exploration, lead to the development of new technologies; 2) the US is the repository of knowledge on the exploration ofspace; 3) the US must provide the foundation for future exploration; 4) space provides the excitement and stimulus to create a scientifically literate society; 5) space exploration will provide the scientific basis for the policy decisions that will protect the future of the planet; 6) space exploration can be used to provide the scientific basis for future technology; 7) the space program can be used as a model of management excellence and integrity; and 8) space exploration can promote a spirit of cooperation among the nations of the world. This session was directly concerned with two questions: the first: how we and the materials we need to get into space can be lifted off the surface ofthe Earth, and second: once there, how we harness those resources that are necessary to achieve self-sufficiency. Papers in the transportation section of this session ranged from applications of the mass driver, to microwave power beaming and microwave­boosted spacecraft, lunar exploration, water­extraction from near-Earth asteroids and chemical rocket propulsion systems. 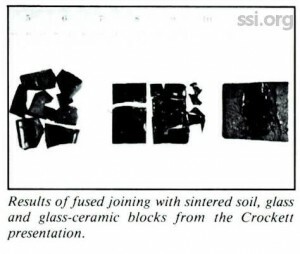 The materials section offered innovative ideas in the areas of mining lunar materials, ceramic-ceramic joining techniques, and the search for near-Earth asteroids. The transportation session began with a paper by Nickolaus Leggett and Judith Fielder on applying mass driver technology to the practical problem of monitoring the ozone layer. 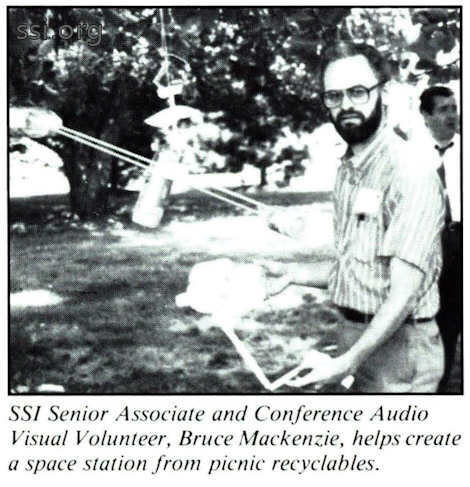 The second paper, by Bill Brown, demonstrated a microwave beam-powered and beam-riding helicopter which could be used to develop public awareness ofthe reliability and safety of microwave beamed power. Paul Bialla of General Dynamics Space Systems discussed a return to the Moon to do those things that scientists and engineers feel are most urgent with minimal development of radically new hardware. Leik Myrabo presented a paper by himself and Joel Limmer of RPI, which described a new transportation system that used a novel construction technology: using transmitted microwave power with high energy density and a narrow beam to propel light spacecraft made of inflatable tensile materials. 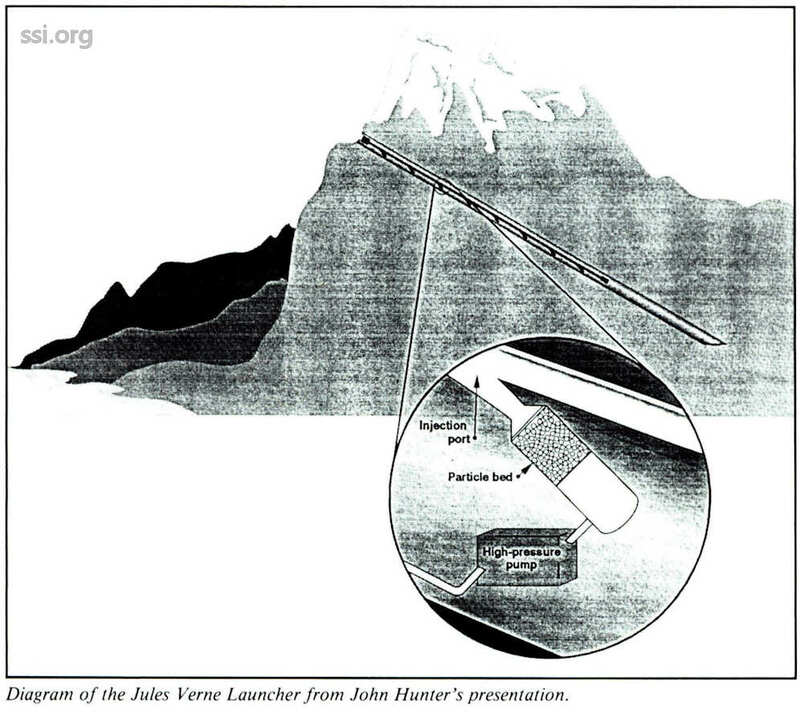 Session chair John Lewis summarized his own work in determining the implication of water extraction of near-Earth asteroids. The last paper in the transportation session was given by John Hunter of Lawrence Livermore Labs. He presented a chemical propulsion technology for rockets that could in the future create a full-sized Jules Verne type launcher. In the materials section Rudy Keller, well ­known in the field of materials processing, and his associate, David Stofesky, discussed the use of aluminum as an engineering material on the Moon to build structures and also as a potential fuel for rocket engines. 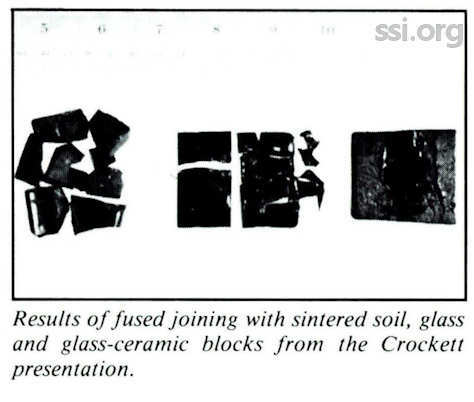 Robert Crockett delivered a paper, co-authored with Brian Fabes, which demonstrated the myriad problems encountered attempting to seal ceramic pieces and join sintered blocks of lunar regolith simulant. If this technology can be perfected, it would make vast masses of material available for use in structures without the necessity of extracting and fabricating them. Keith Rogers from MIT summarized the grossly exponential rate of increase in the number of known near-Earth asteroids and updated conferees on the history of the discovery effort. He furtherdescribed the Space Guard program which finds asteroids and monitors asteroid hazards. In conclusion, session chair John Lewis urged conferees to go after the settlement of space with imagination, optimism and the determination to demonstrate the technologies needed to meet the needs of those living and working in space, as well as those on Earth. This session focused on the governmental and international factors for planning space development and included papers on space policy and law, the use of military technology and implications of the breakup of the Soviet space program. 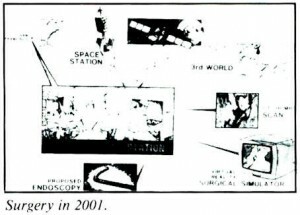 Two papers addressed space and the military: In the first paper Robert M. Lawrence, from Colorado State University, proposed making available to the UN Security Council the products of military satellites: UNSATS. Alex Gimarc of the U.S. Air Force, in the last session paper, discussed the new strategy by the military to integrate its existing capabilities into the new world order. In the area of space policy and law, a paper by Bruce Marks and Michael Walker at the University of Denver College of Law raised the issue of trying to harvest extraterrestrial resources without legally binding rules to govern this development. The authors suggest adapting the Mining Law of 1876 to space mining. A second paper in this area, given by George Robinson from the Smithsonian Institution, questioned the implications of mankind’s expansion into space – specifically, the effects of cross-contamination of planets and spacecraft through manned and unmanned activities, and the area of space-related activities that demand knowledge of the basic absence and, if present, the nature of homo sapiens. 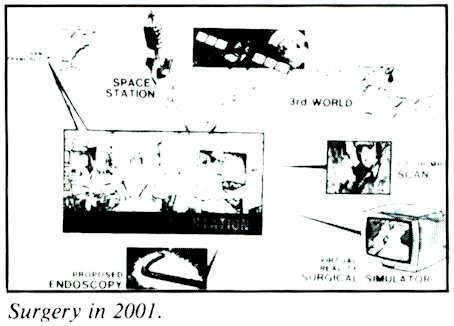 The programs of NPO Energia, the Russian agency responsible for the Energia family of launch vehicles, the MIR space station and the Buran orbiter were discussed by Chris Faranetta of Energia USA in the context of their availability to the US and international space community since the breakup of communism in the Soviet Union. This session occurred over two evenings and addressed the question of how we should proceed to open the High Frontier. Morris Hornik, co-chair of the session, introduced three panelists who delivered statements on this problem, along with an outline of issues that conferees might consider in defining the critical path for space exploration and settlement. A number of divergent views surfaced, particularly with respect to governmental involvement in space projects and operations and its effect ­ pro or con – on space development. Over the course of the session neither the scope nor the direction of efforts could be made compatible with the majority of views expressed. However, all agreed that the purpose of SSI’s High Frontier conferences was that participants leave with the intention of pursuing those aspects of critical activity that they are excited about and are able to undertake. Morris Hornik summarized his own impressions of this session, concluding that perhaps defining a single critical path is not as important or valuable as the need for individuals and organizations to continue to do useful work toward accessing the High Frontier. Toward this end, Space Studies Institute can play a vital role in facilitating and accelerating this work by serving as a clearing house for projects, persons and ideas in the months and years ahead. The Institute should also, he believes, select and promote a scenario for space development and then select and execute work that advances that scenario. This session looked at a number of very diverse aspects in support of our eventual life (and death) in space – from well-defined biospheric and medical programs to philosophical considerations. Two papers concerned the areas of food production and diet in space: the first, by Judith Fielder and Nickolaus Leggell, outlined a lunar-based agricultural system emphasizing diversity of plant selection, the use of small modular units and intercropping to minimize risk and maximize production; the second paper, from Keith Trivelpiece of California Polytechnic, focused on the proposed economical and health benefits of a vegetarian diet in space and the essential connection between resources available and what we eat. 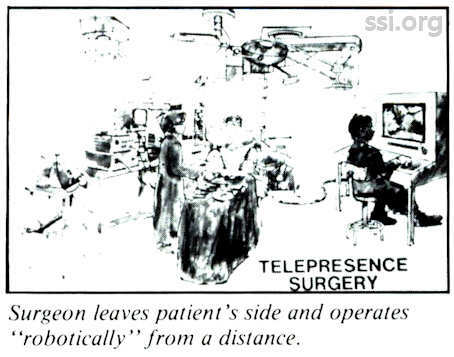 Col. Richard Satava of ARPA defined the technique of robotic laproscopic surgery, a procedure now in its prototype phase at the Stanford Research Institute which, if used in space, would not require the immediate presence of physicians to perform surgical procedures. In a paper offered by Theodore Hall from the University of Michigan, the gravitational effects of rotation in building space structures were considered, demonstrating what happens to gravity in an Earth-normal situation vs. the effects of rotation in such gravities as the Moon and Mars, for example. He concluded that we need to find appropriate “comfort zones” within the various levels of gravity for people living in space. Death in space and one’s emotional response to this inevitability was discussed by Erik Paterson, who suggested that people need to prepare themselves for the death of astronauts and other space inhabitants and give themselves permission to grieve. This session reviewed the human factors that influence space development, including economic, legal, political and social concerns. The first paper, by Gay E. Canough, offered a model to develop a risk/benefit analysis of solar power satellites. Concluding that eliminating the risk factor completely is impossible, she examined three methods of which the cost/benefit analysis is the most creditable and workable. While any numbers in such an analysis are “soft,” they provide a focus and set up the issues to be addressed. The next three papers concerned the area of space law, which is the legal application of space policy. Using the philosophical concepts of John Locke – the ideas of natural law, the state of nature and the rights of the individual – Stephen Houghton examined the philosophy behind individual and property rights on Earth as they would be applied to space. The questions raised by this paper focused on the role of the nation-state vs. that of international or human rights organizations as the space frontier is settled and whether a new social contract is needed. 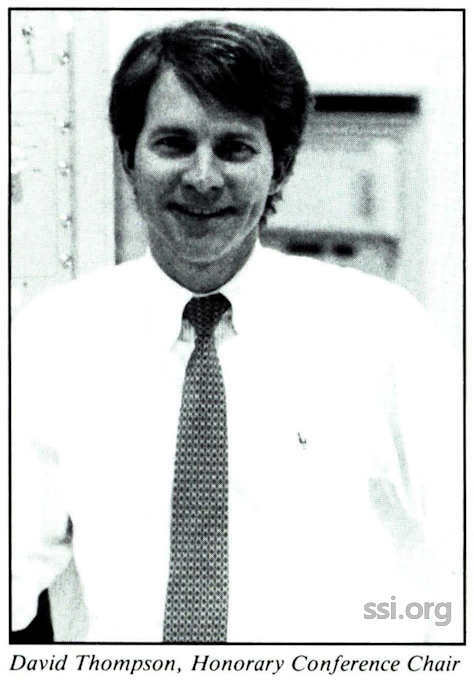 The second paper was given by James E. Dunstan, an attorney specializing in space law. It dealt with the laws concerning liability in space, wherein the standard is that nations are liable for the activities of their nationals, and there is no cap on damages to be recovered. Space is the only area where there are no negligence laws. Dunstan’s paper addresses the changes in space law needed to make activity in space more accessible. Nathan Goldman is a lawyer and professor at Rice University. In his paper, he reviewed three eras of space law. The first, from 1957 to 1979, was defined by a US vs. Russia mentality and a pro-state, anti-private enterprise bias in space law. During the second era, from 1979 to 1990, space law atrophied because of a real dichotomy of philosophy among nations. Since 1990, however, we have entered a third era of space law characterized by continued maturation of space, which benefits everyone since a new era of private investment and development in space has begun. This session highlighted means to establish lunar and orbiting space structures and covered fabrication methods, the use of lava tubes as lunar habitats, space station design and architecture and adapting existing Shuttle external tanks for space habitats, platforms and laboratories. 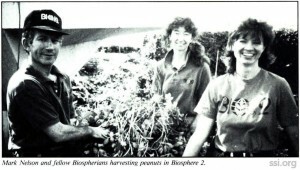 A special event incorporated into this session was a live videophone hookup with Biosphere 2 in Arizona, where residents Mark Nelson, Director of Environmental and Space Applications, and Abigail Alling, Associate Director of Research and Manager of Marine Systems, described their two-year closure experiment in a complete life support system. David Gore, founder of Incre, Inc., presented the first paper in the Structures session. 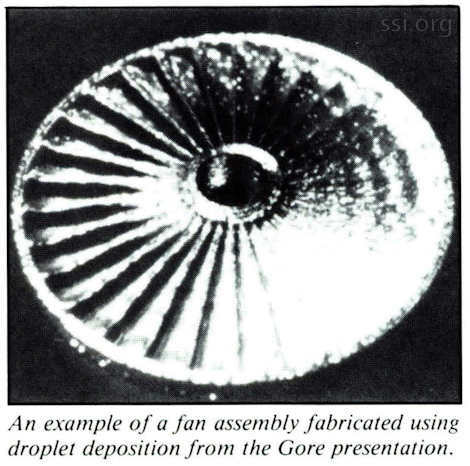 He discussed the process of incremental fabrication by droplet deposition, a computer ­driven method of ejecting and depositing small increments of molten metal to a structure, gradually building it up into any shape required. This process, which does not depend on gravity or on ambient gas pressure, could be used to build structures, manufacture tools in space, and build rocket engines. The next paper, by William Bogen, described a possible path from the evolution of a small lunar colony to the capitol of a space civilization. Lunar lava tubes, large caverns formed by lava flows on the surface of the Moon, could provide quick and simple thermal, radiation and meteor protection for lunar colonists. The third presentation from Antonio Germano and Werner Grandi, who head an Austrian architectural firm, depicted large futuristic space station/colony design pro]ects, the immense size of which would necessitate their being assembled in stages. These projects were divided into four categories, each of which was shown in detail. 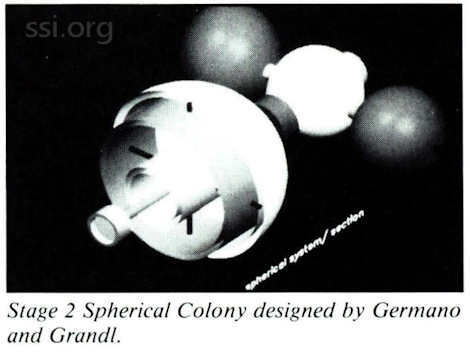 The next two papers covered uses of external tanks: the first, by Gene Meyers, author of “ET-Solutions,” detailed how a space station consisting of linked spent ETs could benefit a wide range of American industries. He further outlined a loan guarantee program to build privately funded ETs for a California Space Station. 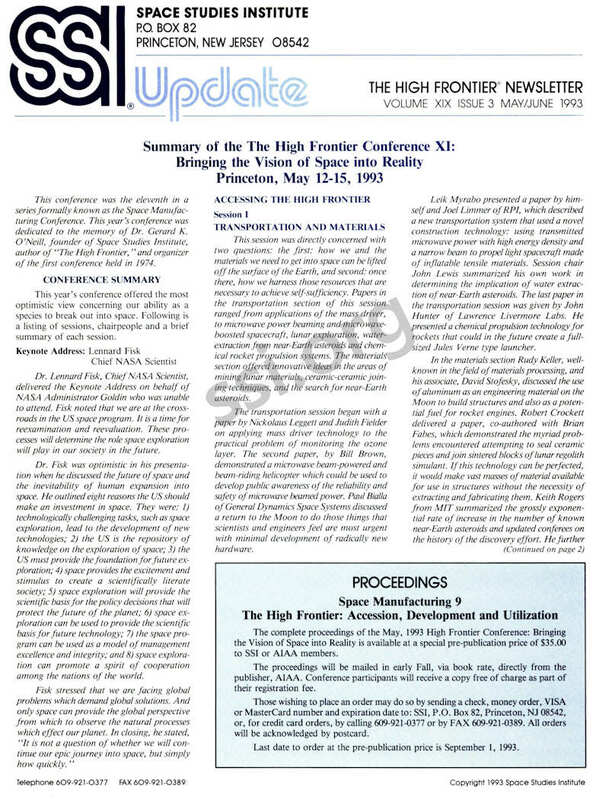 The second paper, from Richard Pagano and E.M. Enright of Martin Marietta Manned Space Systems, discussed using various modified external tank components to construct orbiting space labs or platforms that could accommodate any user application and be tailored to the customer’s requirements through modularity of the barrel sections. This session addressed the goods and services that will meet the needs and be the exports of future communities in space. 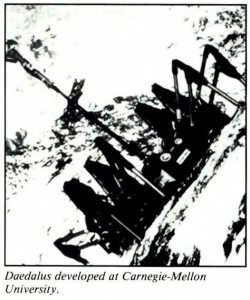 Papers covered a diverse range of areas: laser beamed power, robotics, solar energy systems and the uses of space-based solar power satellites, and terrestrial mining techniques. 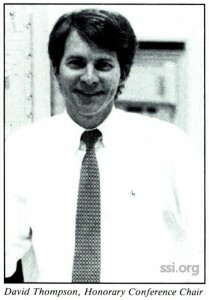 The first paper, offered by Thomas Jolly of Lockheed, described a technique for using laser beam energy coupled to heat exchangers which would heat propellant (in this case water to a very high temperature. The next presentation, from Paul Klarer of Sandia National Laboratories, discussed using a MIRV to drop small robots enclosed in gas bags onto a planet, thus providing these mini-rovers with a soft landing. The concept of the third paper from Connie Senior was that of collecting solar energy into a waveguide and then, with the waveguide, delivering this to a salt solar­thermal reactor getting concentration factors in the range of thousands. T.M. Morse offered the concept of cheap, fast nuclear electric thrust propulsion systems for human and freight missions in the solar system. Dr. Peter Glaser presented a paper by Lyle Jenkins of the NASA Johnson Space Center which covered space-based geoengineering benefits for the global environment, specifically site monitoring spaceship Earth and its condition. He reviewed a number of different technologies !hat could be applied to space to benefit Earth’s power needs, control pollution, etc. Dr. Glaser’s own paper gave a wide-ranging view of the many and varied concepts for solar power satellites that have evolved since his original proposal over twenty years ago. The next presentation by Egans Podnieks of the U.S. Bureau of Mines described how to apply the most efficient Earth-mining techniques to mining the lunar environment or asteroids, rather than trying techniques untested in reality. Returning to the area of robotics, two papers addressed adapting robots for extraterrestrial exploration. 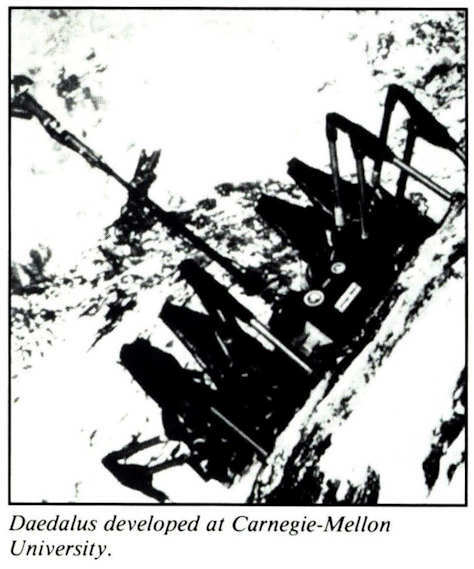 The first, by Charles Luria, discussed a variety of small robot machines for exploring asteroids; the second paper, from Gerald Roston of Carnegie Mellon University, gave an overview of the robots being developed at Carnegie Mellon, including Daedalus, a walking robot, and others which could be adapted to space exploration. 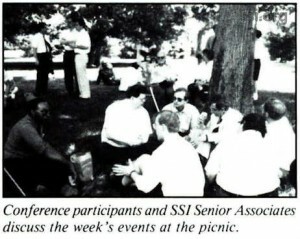 Dr. Jerry Grey presented his perspectives on the history and importance of SSI’s Princeton Conferences. 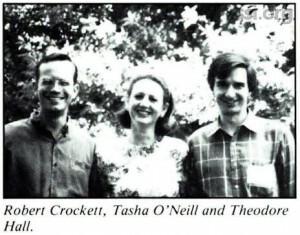 He traced the beginnings of Dr. O’Neill’s work on Space Colonies from the famous 1969 freshman physics course at Princeton University. 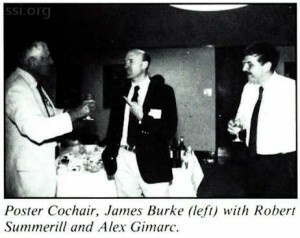 Grey, who served as conference general chairman during the late 1970’s, described the growth of the space industrialization community as represented in our meetings. He noted that through these sesions and the work of the Space Studies Institute, the discussions have changed dramatically; the technical feasibility of space colonies and space power is no longer an issue. Rather, the question now is whether or not these projects can be accomplished economically. David Thompson, Chairman of Orbital Sciences, discussed the microspace revolution. This area of physically small and relatively inexpensive space systems accounted for about 10% of the commercial activity in space last year. 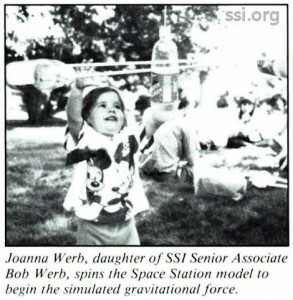 This is a new field which began in 1987 with an AIAA and DARPA conference. By using small inexpensive hardware, services are available to a much larger group than that traditionally serviced by space systems. The microspace segment is consequently enjoying rapid growth with about $500M in revenues last year and the generation of 8,000 jobs. He predicted that mobile communications systems will further accelerate this growth and that costs will drop another 50% over the next 3 years. Gregg Maryniak reported that SSI and its allies have succeeded in convincing the aerospace world that the use of space resources for space projects is sensible. However, in order to open the High Frontier it is necessary to change the models that decision-makers and the public have about space. For example, present thought about humans in space is that a few elite astronauts will inhabit lunar bases and space stations while the audience believes that space is the equivalent of the New World, with opportunity for all. He suggested two critical areas of technical work. First, the need for an expanded survey of the resources available in the solar system. Second, the need to reduce the perceived risks involved in energy supply to the Earth from space. Following the close of the summary session on Saturday many conference participants and SSI Senior Associates joined the SSI Directors and Staff at the SSI offices for a box­lunch picnic. It was a wonderful opportunity for the attendees to informally exchange ideas. The picnic is a tradition begun in 1985, which we all look forward to. The SSI staff is indebted to the efforts of our volunteers for the smooth running of our conference. Helping the staff at the registration table were Megan McCruddin and Marilyn Heebink. Inside the lecture hall, Bruce Mackenzie and Jerry Ward organized the slides and viewgraphs. Jay Thomas (SSI’s high school intern) and Robert Segal (a design student from N.Y.C. ), when not manning the lights, were backup personnel. We also were pleased to have the extra help at the picnic on Saturday. Fred Montana (Omar the Tent Man), Christine Greber, Brendan Gill, and Carole Hornik were great. Also, thanks to all the willing helpers who were not specifically tasked with a chore, but helped out anyway – we couldn’t have done it without you! The High Frontier: Accession, Development and Utilization. 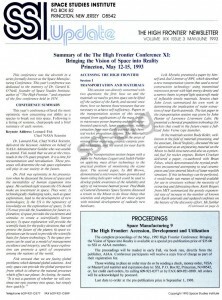 The complete proceedings of the May, 1993 High Frontier Conference: Bringing the Vision of Space into Reality is available at a special pre-publication price of $35.00 to SSI or AIAA members. The proceedings will be mailed in early Fall, via book rate, directly from the publisher, AIAA. Conference participants will receive a copy free of charge as part of their registration fee. Those wishing to place an order may do so by sending a check, money order, VISA or MasterCard number and expiration date to: SSI, P.O. Box 82, Princeton, NJ 08542. All orders will be acknowledged by postcard. Last date to order at the pre-publication price is September 1, 1993. This column features messages to and from our members. At the recent conference many SSI members and conference participants expressed the desire to keep in touch between conferences. Mitchell James suggested using email and volunteered to coordinate the effort. Those wishing to be a part of this online discussion group can join by contacting Mitchell at xxxx-xxxx@xxxx.com. SSI is not monitoring the system, so please direct any questions to Mitchell. We hope to participate in the future, but our current computer system does not allow us to use a modem. SSI is in need of either an Apple Macintosh computer or an IBM compatible computer. We are seeking a donation of an unwanted but working computer to dedicate for modem, bulletin board and email use. We have the modem, if you have a computer that you would like to donate (or lend) for this use, please contact SSI. SSI is considering producing a short video. The most expensive part of this project is the creation of new graphics and animated footage. If you are in this field and if you can donate your time, experience, and creativity to this project, please contact Barbara Faughnan at SSI. EM Drive and Mach Effect Researchers! Get your free copy of the ENTIRE 337 page 2016 Breakthrough Propulsion Workshop Proceedings by clicking RIGHT HERE!